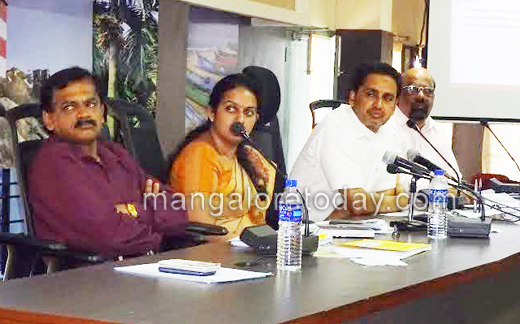 Mangaluru, May 15, 2015: Chairing a malaria review meeting on May 14, Thursday, DK DC Adoor B Ibrahim has directed health officials to work towards eradicating malaria along with checking the rise in malaria cases in the district. He also said that the officials should draw up an action plan by following programmes initiated in other parts of the state and country. There is a need to probe into the death of four persons following suspected malaria in the district since January, he said. The DC said that a meeting of the educational institutions will be convened seeking the support of the students in creating awareness on the spread of malaria on May 18. District Malaria Control Officer Dr Arun Kumar said that the four suspected malaria deaths have been reported in the district since January. Out of these, one person hails from Madhya Pradesh, one from Belthangady and two from Mangaluru. He said from January to April, 1,432 malaria cases have been reported in Dakshina Kannada, of which, 1,296 cases are from Corporation limits. MCC Environment Engineer Manu Kumar said that 20 wards in the MCC limits have been identified as high-risk wards. The Multipurpose workers of the civic body are visiting the residential and non residetial areas and ensure that the mosquito breeding grounds are destroyed. The chemical spray is being carried out in non residential areas once in a week to ensure that malaria do not rise in the MCC limits. The MPWs have been trained in the usage of software developed for collecting statistics on malaria. Explaining the software developed for collecting the statistics on malaria, Naren Kuduvat of I-Point said that the software has already been developed and the installation process is on. The software will assist in malaria management when the malaria cases are reported from hospitals, laboratories or from residential areas. The multi-purpose workers (MPW) of the MCC will visit the spot with a tablet equipped with GPS technology. They will upload the photographs of mosquito breeding places as well as the spot from where the cases reported. The details will be on the website of the MCC for the officials to monitor and for follow up work. The software will display a list of measures to be taken. This would help in a better service delivery.